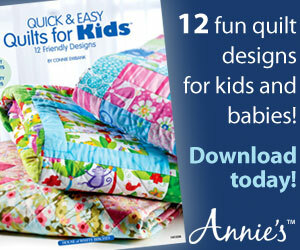 The ¼-inch seam allowance is a staple in almost any sewing or quilting pattern on the market. You may have been guesstimating your own seam allowances in the past, but this is a big mistake. The difference between “exactly ¼ inch” and “nearly ¼ inch” can make or break a finished sewing project by the end, as all of those little near-misses add up to one big difference in the finished dimensions of your project. Take a quilt block, for instance – if your block is supposed to have four seams of ¼ inch each, and your seams are actually ½ inch, then your finished block will wind up being one full inch too small when you’re finished sewing it! In many quilting projects, your fabric will start to ripple and pucker if you use improper seam allowances as you sew, giving your finished project a flawed look. 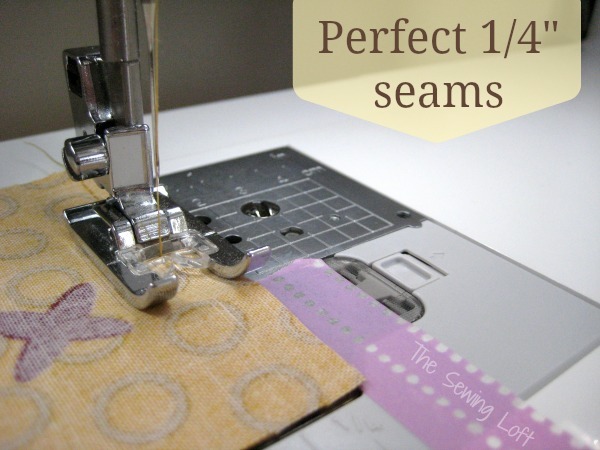 There’s a simple way to avoid these problems: take a little time to practice the perfect 1/4″ seam! This sewing tip will empower you to master any project in the world of sewing and quilting, so let’s get started! 1) Take two scraps of fabric and position them with right sides together. Sew a straight seam with your regular seam allowance as if you were piecing a quilt block. 2) Take the fabric out of your sewing machine and lay it flat on the table in front of you. 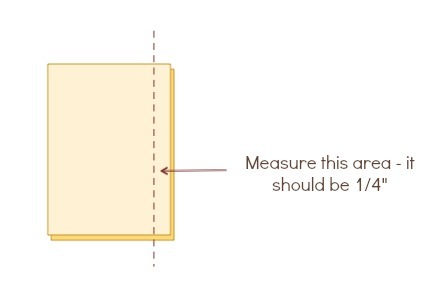 Use your ruler to measure the seam allowance from the sewn seam to the edge of the fabric…. Is it 1/4”? ● Is your seam too big? Sew again, going just a little bit closer to the edge of the fabric, and re-measure. 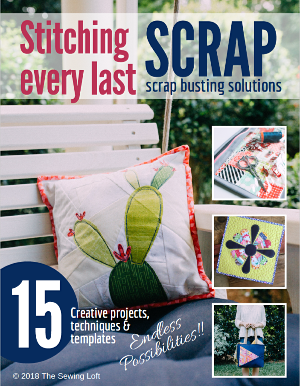 (It might be easiest to use a new pair of fabric scraps every time so you don’t confuse the seams.) Repeat until you know exactly how to sew a 1/4” seam. ● Is your seam too small? Sew again, going just a little bit wider; re-measure and repeat as needed. 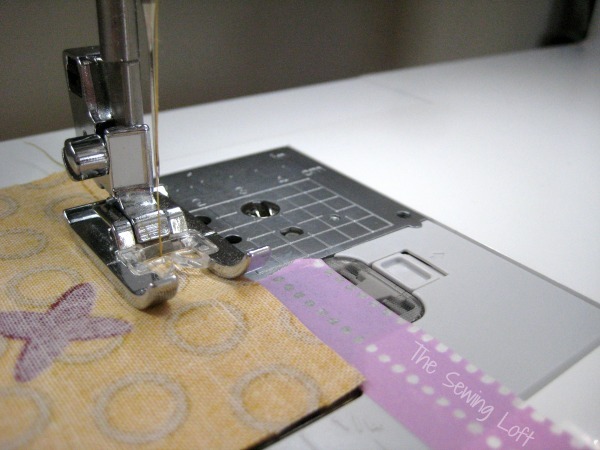 After you have found the sweet spot of seams, place a strip of tape (washi tape works well for this as it’s easy to see) along the machine so you know where to line your fabric up as you sew. Does your machine have markings next to that place already? 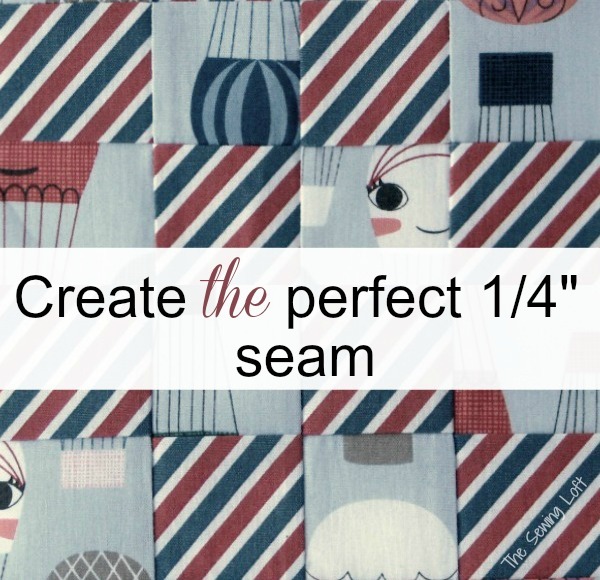 Mark the line or measurement which will give you perfect 1/4” seam allowance. It only takes a few minutes to find that perfect fabric position to give you accurate ¼ inch seams, but those few minutes will save you hours of headaches in the future of your sewing! So glad you can use the tip Helen! When I started quilting this time last year I had problems with repeated accuracy of the 1/4″ seam. So I went into the garage and found some blue masking tape and taped my machine at the required spot from front to back. I could see that my material was going straight back at 1/4″ and my first quilt pieced together rather nicely. When seam allowance counts, I love to reach for the tape. It is the perfect visual and can be easily removed. Wonderful Susan, I just love it! Awesome! Thank you so much for this tip. I’ll definitely be using some washi tape since I have a lot. Now maybe my seams will be straight from start to finish. It’s my favorite crafty tool Annette. I actually even travel with it.